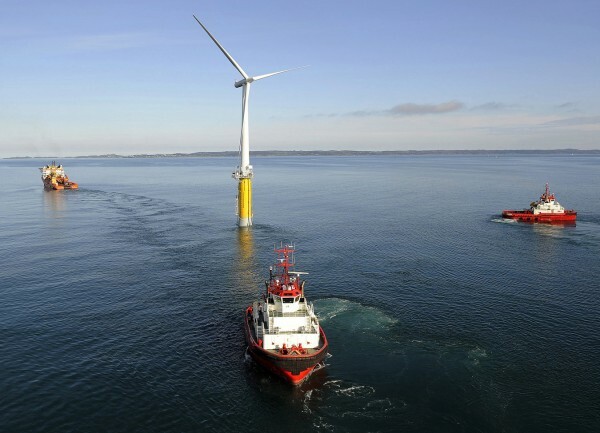 The world's first large-scale floating wind turbine, installed by StatoilHydro and Siemens, is located approximately 7 miles off the southwest coast of Norway at a water depth of about 220 meters. AUGUSTA, Maine — Statoil North America is putting its efforts to develop an offshore wind energy project in Maine on hold until the fall because of last-minute legislative changes to the state’s energy policy. Those changes stalled Statoil’s already approved project while allowing the University of Maine a second chance to submit a proposal to the state. Statoil informed the Maine Public Utilities Commission of its decision in a letter Wednesday. In it, Lars Johannes Nordli, Statoil’s vice president of wind development, said the company had reviewed the language of LD 1472 and decided it was in the company’s best interest to put its Hywind Maine Project on hold. The bill allowed the University of Maine and its Advanced Structures and Composites Center to move forward with an offshore wind demonstration project. “The language of the bill as adopted is somewhat unclear,” Nordli wrote. “However, Statoil interprets it to mean that the future of any contract for the Hywind Maine Project is in doubt, and that any final approval of such a contract would not occur by this summer as anticipated. “Given the risk and uncertainty created by LD 1472, Statoil is therefore preparing to put the Hywind Maine Project on hold, while we continue to assess the changes made to the law, the total risk picture and progress plan going forward. We will keep the option open to re-initiate project activity if a [power purchase agreement] can be concluded according to the term sheet, and the total risk picture in Maine is acceptable,” the company wrote in its letter to the PUC. However, Aanestad said Maine is not the only place the company is looking to launch its pilot project. Senate President Justin Alfond, D-Portland, said Wednesday that he and Senate Majority Leader Seth Goodall, D-Richmond, had a conference call Wednesday morning with Statoil officials. Alfond attacked Gov. Paul LePage and Senate Republicans for scuttling the deal, which he said would have resulted in hundreds of millions of dollars of investment in Maine and hundreds of jobs. LePage has long been a critic of wind energy in Maine and has opposed supporting Statoil’s pilot wind energy project with funds from electric ratepayers. LePage vetoed an omnibus energy bill that lawmakers worked on for most of the legislative session. As a condition of his support of the bill, LePage wanted the PUC to reopen its case to allow University of Maine to have an opportunity to lobby the PUC for ratepayer support, even though the university did not respond to the request for proposals that resulted in the Statoil deal. The omnibus energy bill was vetoed by LePage June 19, but lawmakers strongly overrode the veto, including a unanimous vote in the Senate. That came after passage of LD 1472. Patrick Woodcock, director of LePage’s energy office, said Statoil’s announcement Wednesday was expected. Goodall said Wednesday he had never heard anyone from Statoil indicate that they were not committed to the Maine project or that they would put it on hold. On June 24, the day after LD 1472, passed, LePage dodged any responsibility for the legislation. Adrienne Bennett, LePage’s spokeswoman, elaborated on LePage’s position. “The amendment would allow for more competition with UMaine, and that’s simply something he thought was necessary to move forward,” Bennett said June 24. Statoil’s decision could be a major blow to Maine’s development of an offshore wind industry. “These types of opportunities do not happen often and they definitely do not happen often in Maine,” wrote Annette Bossler, an international business consultant in Bremen, in testimony to the PUC when the commission was considering Statoil’s project. “If the Statoil Hywind project in Maine does not happen, the result will be that Maine will be off the list for floating offshore. If a major player in the floating offshore wind industry such as Statoil starts the work in Maine but then the project does not happen, that news will go global as well as the reasons why,” she wrote.